GET YOUR CAR TOWED TO US AND GET A $50 DISCOUNT ON YOUR TOW BILL! In order to qualify for the discount, vehicle repairs must be over $200 and be towards the reason vehicle was towed. If your car is dead, stalled, or you just don’t feel safe driving it to the shop give us a call! Not a AAA member? Don’t worry! We got you covered. At Made In America/Made In Japan, we offer discounted Roseville towing with repairs. 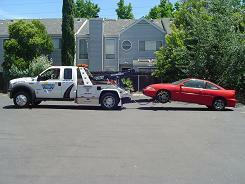 Mention this page when you call us or let your service advisor know you need a tow and we can take care of it for you. We have been working with our certified tow service Central Valley Towing for over 15 years! They are professional and courteous and will take great care of your vehicle. How does it work? It’s very simple! If you need a tow to the shop just give us a call and we will help you get it arranged. After we diagnose and repair the issue that caused your vehicle to require a tow we can apply the $50 discount. You will need to call us first so we can help you make arrangements with our tow service. This offer is only valid using our certified tow service and cannot be used in addition to other coupons, specials, or offers. Offer excludes battery service or replacement.